Relax and reinvigorate yourself with Spa Yoga in Washington DC. At Haute Bodhi Hot Yoga, we’re proud to say that our Spa Yoga class is unlike any other yoga class you’ve tried. While this 75-minute flow class will get you moving, it’s much more focused on helping you gain more awareness into your breath and your body’s rhythms than most other yoga classes. Spa Yoga is performed in a room designed to help you feel calm and relaxed, while also delighting your senses. During your practice, the instructor will be there to offer hands-on guidance, as well as massages, to ensure that you’re getting the most out of your class. With Spa Yoga, you’ll feel like you spent the day at the spa! Why you should give Spa Yoga a shot. Most of the typical yoga classes available today, like Bikram Yoga and Vinyasa Yoga, are designed to help you burn calories and build muscle, but Spa Yoga is a completely different kind of experience. With Spa Yoga, you’ll be able to tap into your body’s own subtle energy on a much deeper level, helping to strengthen the connection between your mind and body. 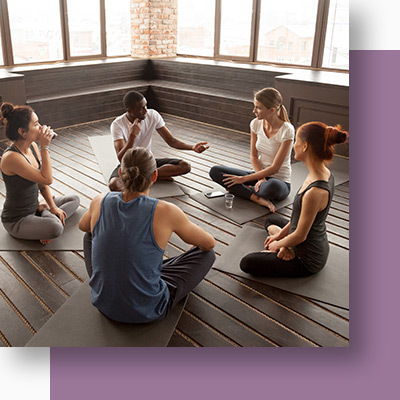 Not only will this translate into a better Spa Yoga class, but it will also help you gain more out of other yoga classes as well. There’s nothing quite as relaxing or reinvigorating at Spa Yoga, and once you try it for yourself, you’ll see why it’s the best way to unwind. Sign up for a Spa Yoga class today! Whether you’re looking for a great way to release stress after a long day or you’re hoping to gain a new level of awareness into your own body and its rhythms, Spa Yoga is a great option. Are you ready to give this one-of-a-kind yoga class a shot? If so, check out our upcoming class times and sign up today!